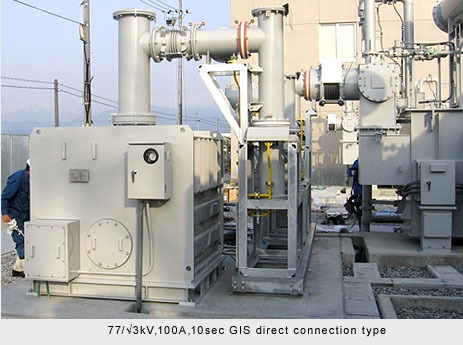 The SF6 gas insulated Neutral Grounding Resistors (GINR) and the serial resistors for the neutral reactor (GSNR) development are completed with the collaborative research of the Kansai Electric Power Co., Inc., and Nissin Electric Co., Ltd. and our company. The production and the delivery of the products are also advanced favorably to electric power companies, the wholesale electric power companies and the comprehensive electrical machinery and appliances. The site acquisition danger of the substations and requests of safety and improvement of the reliability were strong in recent years. It became possible by cooperation with GIS by using the nonflammable SF6 gas where insulation performance is superior and in order for this the enormous heat energy which occurs at the time of ground, it stores heat at one time and with the method of discharging gradually assuring reduction. Of course, it's also possible to pay the bushing connection type. The charging department was exposed to the past air insulation type, but in case of GINR and GSNR, they are equipment of higher safety because charging departments store all in the metal container of the earth electric potential. It tests in complete assembly state at the factory, can do local carrying and installation in state of all the equipment.